WARNING: These pretzels are really simple to make and crazy-addicting! Maybe that's just me...(as I munch my way through my second one). This morning I was in a bread-baking mood and was trying to decide if I wanted to bake something practical and useful like these tasty brioche sandwich rolls or something more fun and snacky like soft pretzels. It should come as no surprise that I picked the pretzels. The original recipe is a copycat one of Auntie Anne's pretzels I got from a Food Network magazine, but I tweaked it a little. If you want the original, click here. Otherwise, my version is below. 1. Warm the milk in the microwave until it is roughly 110 degrees. For me, this took about 2 and a half minutes. Pour into the bowl of a stand mixer and sprinkle in the yeast. Let sit for 2 minutes, then add in the brown sugar and 1 cup of the flour. Let sit for another 2 minutes. 2. Add in the remaining 2 and 1/4 cups of flour and 2 tsp. of salt. Using the hook attachment in your mixer, knead for about 5 minutes until the dough comes together and is soft, but still slightly sticky. 3. Form the dough into a ball and place in a lightly greased bowl, cover with plastic wrap and let it rise in a warm place for about an hour, until it has doubled in size. 4. Preheat the oven til 450 degrees and grease a large baking sheet (I used a stone one). Divide the dough into equal pieces. 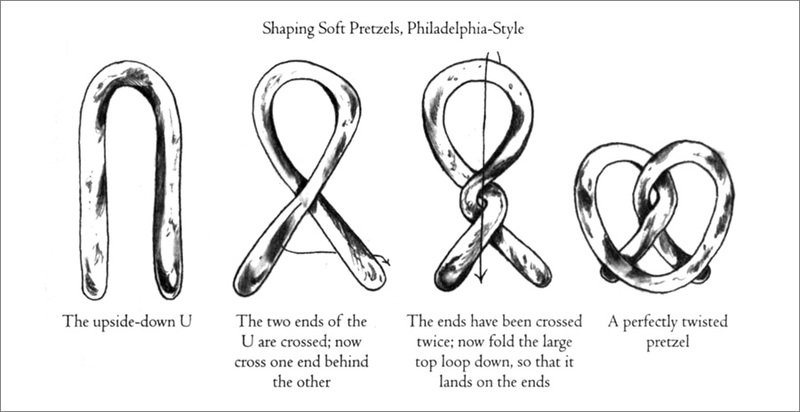 It really depends on how big you want your pretzels. I divided mine into 8 pieces and they made medium-sized pretzels, but you could easily make mini ones or gigantic ones too! 5. Roll and stretch each piece into a "rope" and form each rope into a pretzel shape. 6. Dissolve the baking soda into about 2 cups of water in a shallow pan (I used a pie plate) and gently dip each pretzel in the solution before placing on the baking sheet. Sprinkle with 1-2 tsp. kosher salt and bake 10-12 minutes until golden brown. 7. Remove from the oven and brush with 2 tbsp. melted butter and let cool slightly before gobbling up!